So today I have a little book review/some pictures on a book I recently picked up. It was on my Christmas wish list, and even though I didn't receive it, that didn't stop me from reading it! I bought it at Barnes and Noble for around $25, which isn't too bad since it's a hard cover. 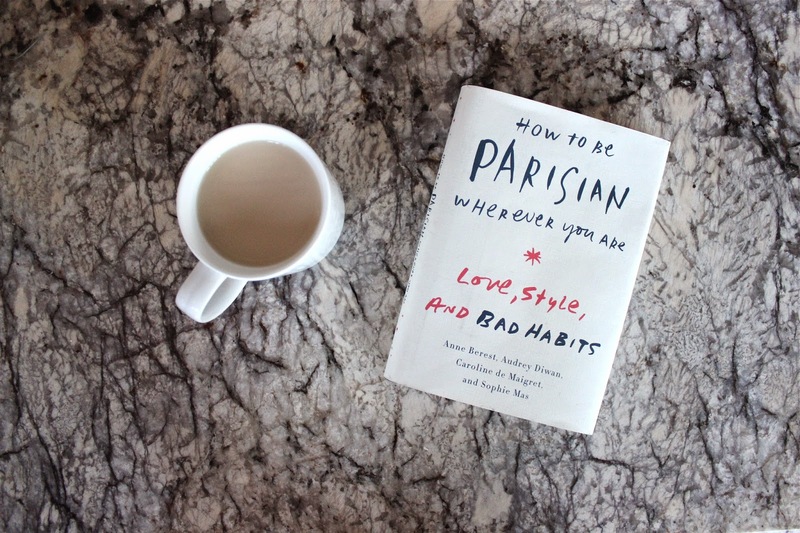 The book is called How To Be Parisian Wherever You Are * Love, Style, and Bad Habits by Anne Berest, Audrey Diwan, Caroline de Maigret, and Sophie Mas. These four women have a fun and interesting take on how Parisian's dress, have fun, love, and behave themselves. The book is divided into short sections. The sections are based on love, style, culture, attitude and men. The authors give their tips, tricks, and past experiences of how Parisian women live and love. They give different situations in which a Parisian experiences daily, and how they deal with everyday life. These women are definitely outspoken and use this book to debunk the myths about what it means to be French. They let you in on all of their secrets and flaws, and poke fun at their complicated, usually contradictory feelings and behavior. This book admits the French to be snobs, self-centered, unpredictable and unreliable, which is quite humorous. The authors place you in different Parisian situations, like a first date, a party or even to the countryside. They tell you how to be mysterious, sensual, look natural, make your boyfriend jealous, how they feel about children, about going to the gym and how to look endlessly cool. I sincerely enjoyed this book. I loved the pictures inside of different Parisian women, about style musts and different places to go while in Paris. I read the book in about an hour and a half. It's a light, easy read and really is very interesting. I like how the authors poke fun at themselves, and realize the Parisians are very snobby and self-centered, but they are just so effortlessly chic, so the tips were extremely helpful. There are also different easy recipes to host dinner parties, which was helpful as well. I loved how the authors told you all about different French customs and norms. For example, Parisians NEVER go out on a Saturday night. For them, the city gets "too busy" to endure, so they usually host dinner parties at their homes on Saturdays, and go out on week nights instead. Overall, I thought this book was truly inspiring and intriguing, and I can't wait to visit France to go to some of the restaurants, museums, and cafes that are suggested at the end! Would you read this book? !